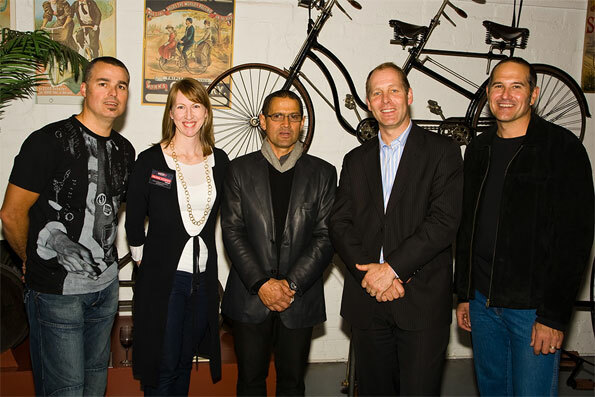 St Kilda Cycling Club is one of Australia’s most dynamic cycling clubs. A not-for-profit association, SKCC provides high quality racing and social activities that encourage and engage cyclists of all ages and abilities. We are focussed on the continuing development of women’s cycling in the club. The Club prides itself on its sense of community, professionalism and its welcoming, friendly atmosphere and is keen to remain one of Australia’s premier cycling clubs. In 1998 a small group of avid cyclists wanted more and thought that they could do better. Over numerous coffees at the iconic Cafe Racer (sadly closed), St Kilda Cycling Club was born. Today we have a reputation for doing things differently, better, smarter and with a sizzle. Pictured here our past Club Presidents gathered on 8 May 2009 to celebrate the club’s 10 year anniversary – (LtoR) Ashleigh Smith, Mel Jacobsen, Rene Bueman, Dean Langenberg and Mike Englisch (missing in action – Zeth Romanis and Jeff Provan). The Club is run by a hard working volunteer committee and sub-committee members; all of whom manage to find time in their busy and hectic lives. We encourage all members (old and new) to join committees or event teams so the Club stays fresh, energized and relevant. SKCC is about people, where cycling is the glue which holds us together. A laugh, great friends, camaraderie, shared pain, passion and a good coffee are our priorities. As a result we are light on egos, rules, policy and big brother, we are big on common sense, doing the right thing and doing it together. Check out our brilliant racing, training and social activities, subscribe to the regular newsletter and then head to the membership link to become a member today!